Hebei Runhong Construction Machinery Manufacture-Pipeline Co., Ltd.
1、The boom adopts Z shaped folded arms, can be vertical folded, and 360 degree horizontal rotation,which realize the full range of pouring in three-dimensional space within the placing radius without vertical rebar's affect, and no dead area. 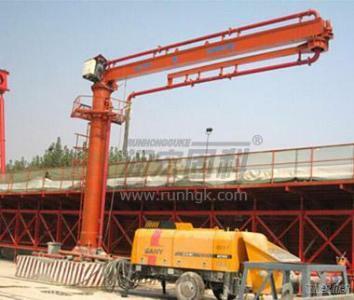 2、 The arm of boom's movement and rotation depend on hydraulic drive, so the machine works stablly , smoothly. The machine can be operated near or remote by two sets of buttons in electronic control box or wired control box, also easy and safe with a wireless remote control operation. 3、Because of the lightweight, according to the needs, it can be put on different construction sites by the tower. It can be put on floor, platform and simple shelf unfixed. With great flexibility, it can adapt to variety of different floors and complicated construction sites.